This map comes from the US National Parks service: the Volendam sailed all the way from Point Gustavus to just south of the US/Canada border at the top of the map to both Johns Hopkins and Margerie Glaciers. On board we were joined by Park Rangers who gave a commentary on what we were seeing. It is worth pointing out to that they were unequivocal about the retreat of the glaciers and its cause. On the map you can see the lines which show where the ends of the glaciers were in the past. 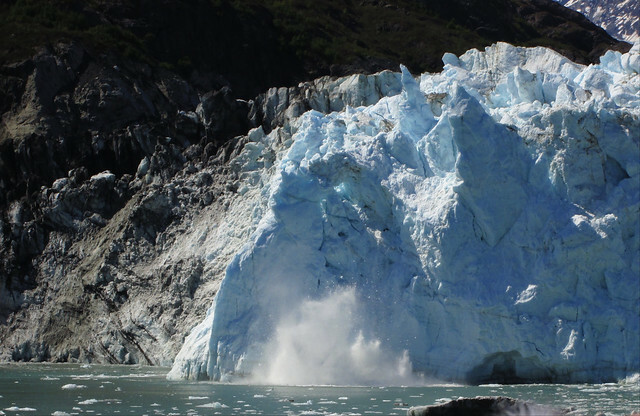 The last photo shows the Margerie Glacier calving. This glacier flows at the rate of six feet a day and the rumbling and creaking noises are almost continuous. The moments when great lumps of ice fall into the water are entirely unpredictable. The bow of the ship was opened up for the occasion but the press of people trying to get the best shots meant that it was easier to go up to deck 6 where there is a viewing platform under the bridge which is actually available all the time. The water was filled with icebergs from the glacier. There were some sightings of wildlife but I did not get any photos: we did see dolphins and sea otters, as well as large numbers of sealions. Others said they had seen humpback whales. Frankly the visit next day to Ketchikan was something of an anticlimax. Essentially it is a small town that has sprawled along the coastline – and because it has four cruise ship berths gets four huge ships in port at the same time and is overwhelmed. There are many gift shops and an interesting area that was formerly the red light district. There is also a funicular, out of service at the time of our visit, and many totem poles. The weather is Ketchikan is notoriously wet – and it delivered plenty of rain. We had been extremely fortunate with bright sunshine in both Glacier Bay and Dawson. The inside passage back to Vancouver was pretty much invisible in fog, low cloud and rain for much of the time but I did manage some nice rainbow shots while eating dinner on the last evening of the cruise. I want to close with some general observations, which I hope might be useful if you decide to make this trip, and I definitely recommend that you do. Understand that if you go early in the season not everything is going to be ready and open, and a lot of the people working for you will be new to the job and still in training mode. Since this is the land of the midnight sun, take a sleep mask or at least a couple of clothes pegs for the curtains to minimize the stray sunshine when you want to sleep. I think an inside cabin on the ship might be a better choice at this time of year. After all you are only going to be in the cabin to sleep. We had a package deal of fly up, road trip and cruise back: this meant we got to see Glacier Bay. If we had done it the other way around we would have missed that. There are seven day round trip cruises, but they miss out Denali and Dawson, of course. While on board you get pretty much unlimited food, on the land trip only a few meals get included. We did not buy a meal plan and enjoyed some very good experiences: 49th State Brewing and Glacier Brewhouse in Anchorage, and Rib & Salmon in Whitehorse were outstanding. Best value for money, without a doubt, was the Salmon Bake in Fairbanks. On the ship we got a “beverage plan” included, but I would choose otherwise in future. A cabin credit goes further and can be spent on board in the duty free before you arrive in Vancouver if there is any left after gratuities and laundry are taken care of. Laundry is well worthwhile, I think, if you want some nice clean, pressed clothes when you get home. We tend to look after ourselves and not spend a great deal on excursions: the Denali Tundra Wilderness and the Gold Dredge were part of our package. The first I would not miss, the second was better than expected, but there are other dredges and gold panning sites we did not see. We did not do any of the Parks Canada walking tours in Dawson and just got lucky to see the press and the theatre. I am glad we did. The river boat tour was also in the package and could have been better, I think. The salmon bake and stage show in Fairbanks were also a HAL excursion which included transport to and from the hotel by schoolbus. Definitely rent bikes in Anchorage – great fun and inexpensive. If you just stick to the brochure deals you will not get much time in Anchorage, which is a pity. We paid extra for one night in the Ramada: trust me, its worth paying more for the Captain Cook. We will definitely go back for the White Pass train ride, and could well be persuaded to do the Inside Passage cruise again if the weather – and a suitably attractive deal – can be relied on. The Alaska Railroad connects Anchorage to Fairbanks, but was not used for the second leg of our tour, north from Denali. This reflects, I think, the growth in traffic generated by the cruise ships. It is easy to add capacity by buying old buses: trains would be a much lumpier investment. On the way up the Park Highway we stopped at a place with a gift shop and an odd collection of old stuff – but of course it turns out that everywhere you go on one of these tours there’s always a collection of old stuff, and a Gift Shop. Fairbanks is a nice little town but we did not get to spend a great deal of time there. They took us on a tour of an old gold dredge. Panning for gold in gravel that has been dug out with hand tools is labour intensive. After the gold rush, serious placer gold mining was mechanized. The permafrost was melted with high pressure jets of water and the gravel was scooped out by a continuous bucket chain which also removed the gold on board and sprayed the rest out the back with a conveyor belt. We did get to try panning and some gold was guaranteed, which caused many to state firmly that the samples of “pay dirt” had to have been “salted’. Actually I do not think that is necessarily true. Placer mining continues using excavators and more modern extraction techniques. Large scale mining using dredges became uneconomic in the 1930s when the US government changed the law to monopsonise the market and fix the price. Although those policies have since changed, the percentage of recoverable gold in the abandoned claims is largely uneconomic. Tourism now pays more people, much better. We did end up with an old film container with a few flecks of dust estimated to be worth US$37. That evening we chose to go to a Salmon Bake which was located in Pioneer Park and then a very well produced live stage show that celebrated the history of Fairbanks. The salmon was silver salmon – not a type I had eaten before – and actually barbecued rather than baked. Even so unbeatable value for money. I am opening this part with a picture I should have used yesterday. We got incredibly lucky with the weather as many people who visit the National Park or its vicinity do not get to see America’s highest mountain, since it is so often blanketed by cloud. This shot was taken from the train on route from Anchorage. We had been getting glimpses of the mountain but usually only the top of the peak behind other mountains. It is 20,310 feet (6,190 metres) high and has over 47 different variants of its name. In Koyukon the mountain was called “Deenaalee” – the Tall One or the High One – until 1896 when a gold prospector, William Dickey, named it Mount McKinley for Presidential nominee William McKinley of Ohio. In 1975 the Alaska Board of Geographic Names changed it back to Denali but it was not recognized federally until 2015 when President Barack Obama changed it. I think it is sad that Holland America (who provided this information) still call their train McKinley Explorer. 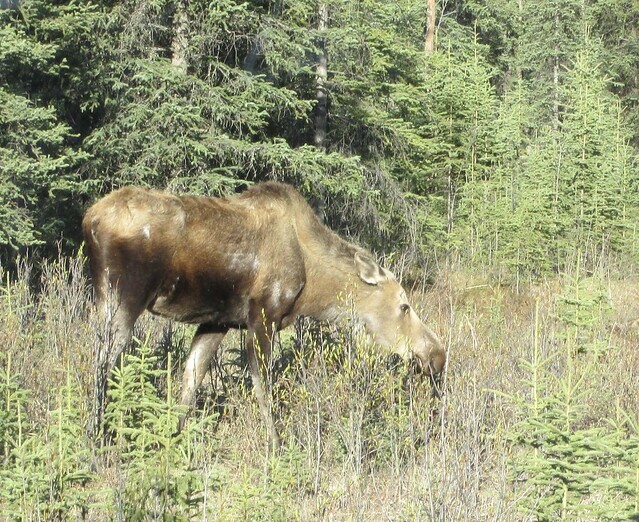 This moose was the first thing we saw on entering the park. During the calving season they tend to hang around the visitor centre where the presence of people tends to scare off the bears. 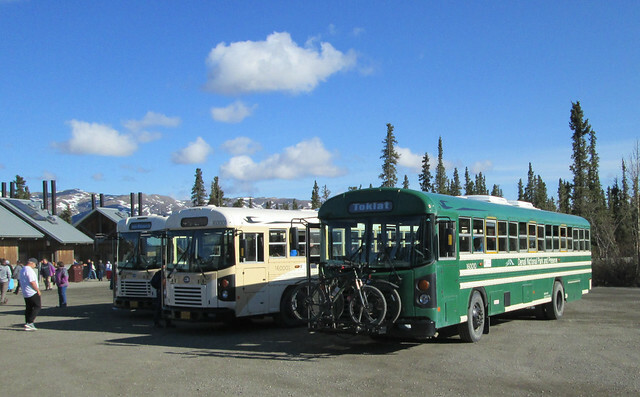 The National Park operates the buses that provide the Tundra Wilderness tour along the only road most of which is closed to other traffic. When we visited the tour only got as far as Toklat, since beyond that point recent heavy snow still covered the road to Kantishna. A temporary tented visitor centre was provided at Toklat since the one at Eielson was inaccessible. 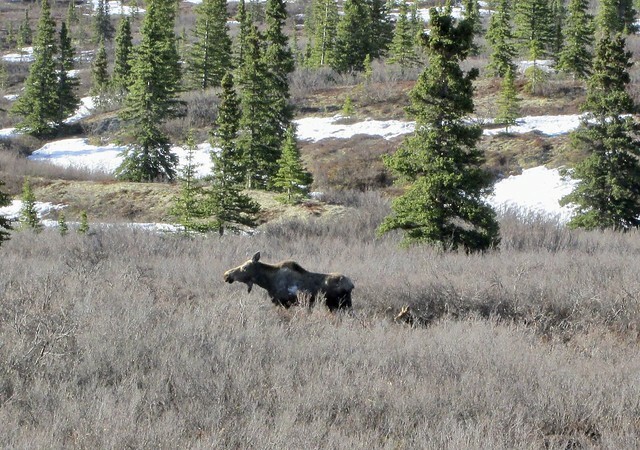 Further into the park we saw another moose and her calf. We carried binoculars – which are essential – and used my little Canon PowerShot A1400 with its puny 5x zoom. Most of the other people on the bus used either stonking great DSLRs with massive lenses or smart phones. There was quite a bit of jostling for the windows. The bus also carries a good video system with a really good lens, so live coverage could be provided by the driver of worthwhile sightings at greater distances. The woman in the front seat always stood up and held her phone in front of the screen whenever there was a really good sighting. She only desisted after I took her aside for a quiet word at one of the rest stops. If you click on the picture of Denali below there are some bears in the shot. 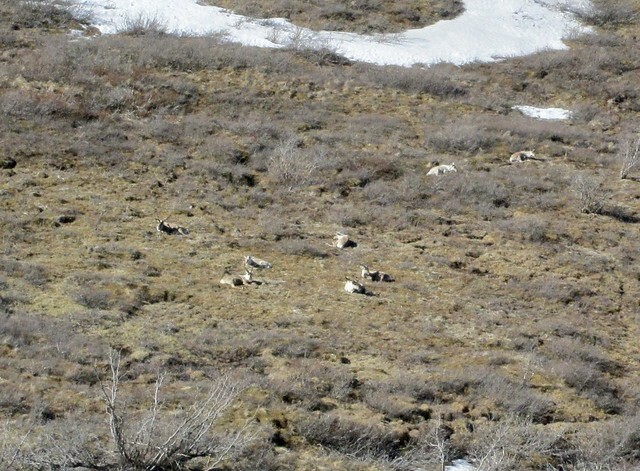 Probably grizzlies – but that look like two brown dots – at the bottom of the image beneath the right peak of the mountain. 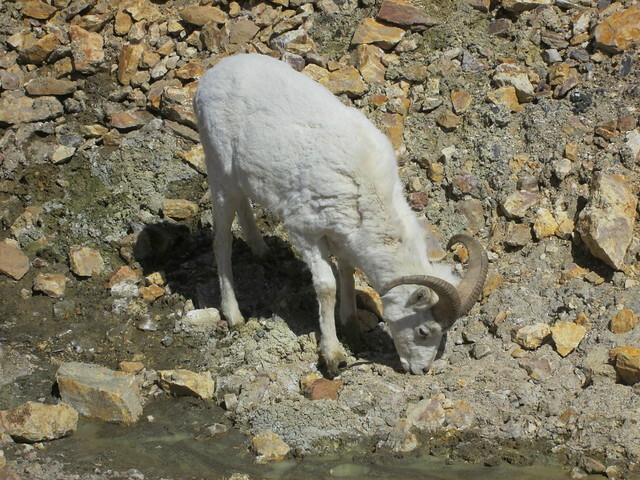 Dall sheep at the roadside: most visitors later in the year only see these as distant white blobs on the ridge line. 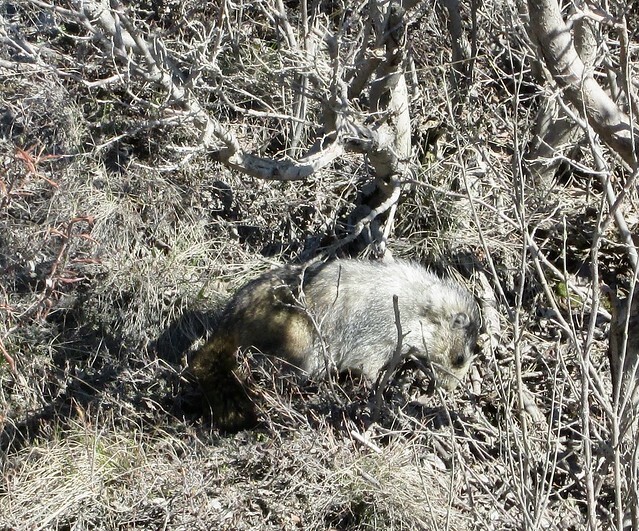 While the bus driver said this was a coyote, I am convinced it was a wolf. We saw a number of specimens in taxidermist shops that looked just like this one. Alaska as a whole warmed by 3℉ (1.7℃) in the last 60 years. This is twice as fast as temperatures are rising in the lower 48 states. The implications are already visible on Denali’s landscape. …Glaciers cover 16 percent of the park, but nearly all of them are now thinning and retreating. The foundation of the park – the ground itself – is also melting. Permafrost is thought to have underlain most of the park when it was founded in 1917, but scientists predict it will be nearly gone by Denali’s 150th birthday. And finally a picture taken by Billie Hyde who was our guide throughout the land tour. This picture is used by Holland America in their publications and also is on the back of her business card which I have scanned. We returned to Vancouver on Wednesday from a trip to see glaciers, railways and the history of The North. We flew up to Anchorage and then took the train to Denali, and from there went on to Fairbanks by bus. Air North flew us to Dawson City then it was back on the bus for Whitehorse and Skagway where we joined our ship, MV Volendam. We had expected to ride on the White Pass and Yukon railway, but a huge boulder on the tracks was blocking traffic, so we had to stay on the bus. The ship took us to Glacier Bay (also a National Park) and Ketchikan (quite the opposite), and then traversed the Inside Passage. That was also a bit of a nonevent, as the first section was overnight and the day was socked in by the weather. Since the way slideshows work on WordPress also requires some effort, and I am sure you will appreciate at least some indication of what you are looking at, I am going to try a series of short slide shows with a little text. Feedback is encouraged, if not a comment then at least a “like”. If this works for the first day or so, then I will post more. Flying in to Anchorage one of the first things you see is the wind farm on an off shore island. Alaska has huge amounts of oil and coal, yet they are also under threat from rising seas and melting permafrost. The stuffed moose is in the middle of the airport lobby – as is the float plane which is unique. The little locomotive was used in the building of the Panama Canal and subsequently on the construction of the Alaska Railroad. Both of these were US federal government initiatives, back in the day when this was about the only feasible way to achieve such results. “People Mover” is a term of art in the transportation business and usually refers to rail based, driverless vehicles in airports and theme parks. I quite like the use of the term by the local transit agency: it does not just cover full sized buses but also vans and shuttles. The large locomotive was built for the use of the US Army in the second world war and then worked on the Alaska Railroad for another ten years. We arrived in Anchorage a day before the start of the land tour to give us more time to explore the town. This meant we were able to rent bikes for a couple of hours to ride the shore line trail which includes a very interesting area where we found the explanation of the very strange topography of the waterfront. Our after dinner walk enabled me to get some shots of the Alaska Railroad – and we also visited the area where most of the townspeople were fishing for salmon. The next morning we joined the train – just two dome cars – with at seat service of drinks and snacks throughout the day and lunch served in the lower deck dining room. The views are spectacular – with glimpses of passing trains in the loops – and the ability to move around and a lower deck open viewing platform. Part two will cover the Denali National Park and our Tundra Wilderness Tour.